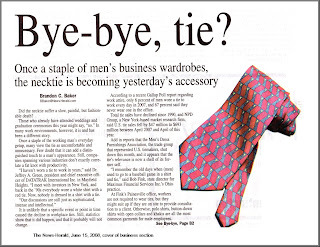 It's funny - when a reporter from the News-Herald contacted me for this article he referenced a recent statistic from the Wall Street Journal, which said that in 2007, it was reported that only 6% of men were wearing ties to work. That very same number had been weighing heavily on my mind since I had heard it the week before. My first concern was: What are the other 94% wearing? And my second thought was how it would affect women's clothing selection, since that is the theme of my book. 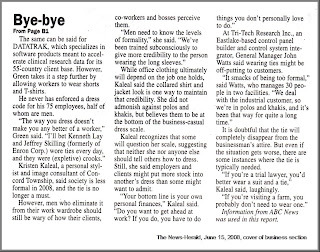 The last thing we need in the American workplace is more dress code confusion!